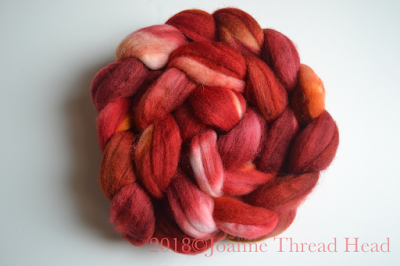 A couple of weeks ago I dyed some fibre to spin for socks. This is my favourite 80/20 Merino/Nylon sock blend. 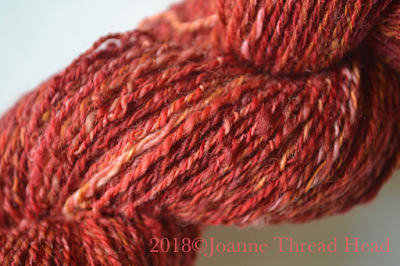 I decided to spin opposing ply yarn for the first time, since it is supposed to make hard wearing socks. Normally singles (the individual ply) are all spun with the twist in one direction and then plied in the opposite direction. With opposing ply yarn one of the singles is spun in the same direction as the final plying direction. This tightens up that one single during plying (more twist creates a tougher yarn). 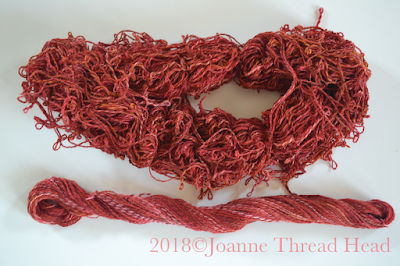 I spun a 3-ply yarn, so two of the singles were spun with a Z-twist and the third was with a S-twist, then all three were plied with a S-twist. This is how the yarn looked fresh off the wheel. 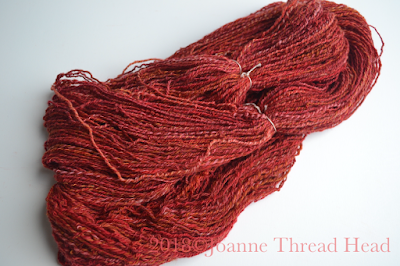 The top yarn is the opposing ply, 3-ply yarn - that one ply added a lot of extra twist to the yarn. The small skein at the bottom is a 2-ply with the leftover Z-twist singles, and made a nice balanced yarn. The yarn relaxed after washing . You can see in the above photo that one of the plies is tighter. 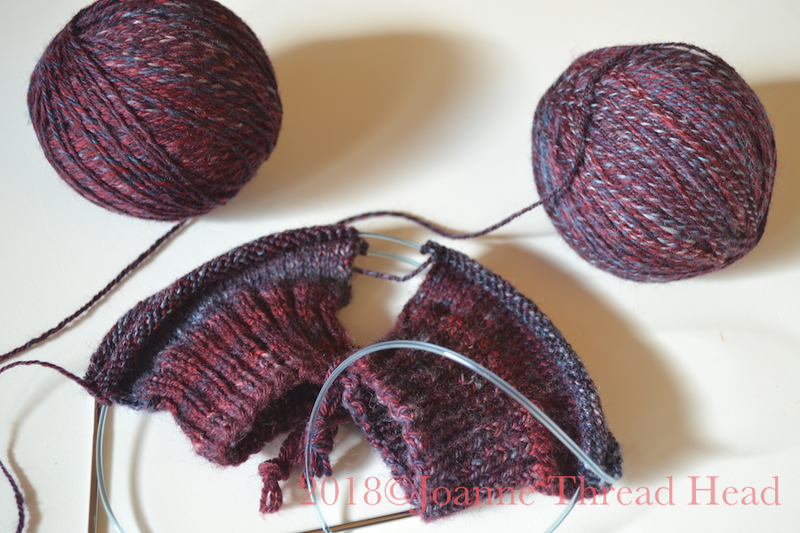 I started knitting a pair of two-at-a-time, toe-up socks with the yarn. I am finding that the yarn is a bit 'rougher' than regular 3-ply yarn I have made with the same fibre (just a bit hard on my hands). I am surprised how even the knitting looks considering how un-even the yarn looks. 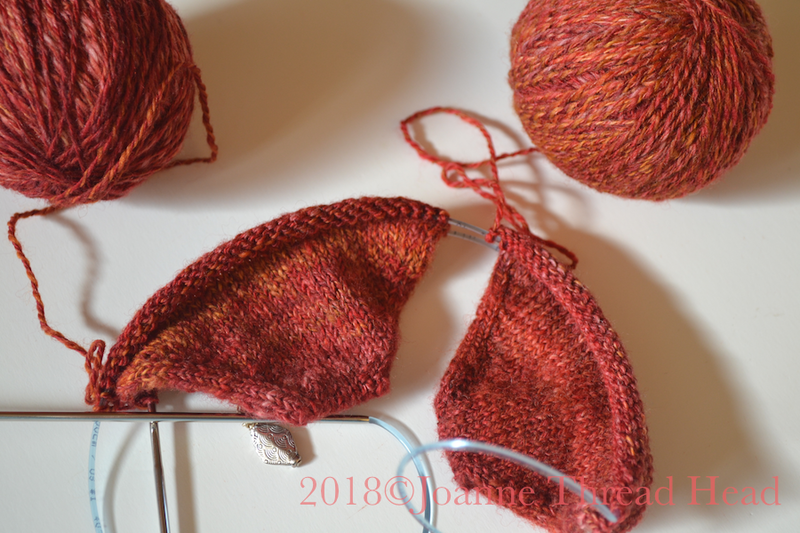 I also have another pair of socks on the go made with the same fibre - cuff-down this time (this is my favourite way to knit socks, but I wasn't sure of the yardage for the red/orange ones, so it was safer to knit them toe-up). They are all 64 stitches on 2.5mm needles. It will be interesting to the effect of the different yarns. 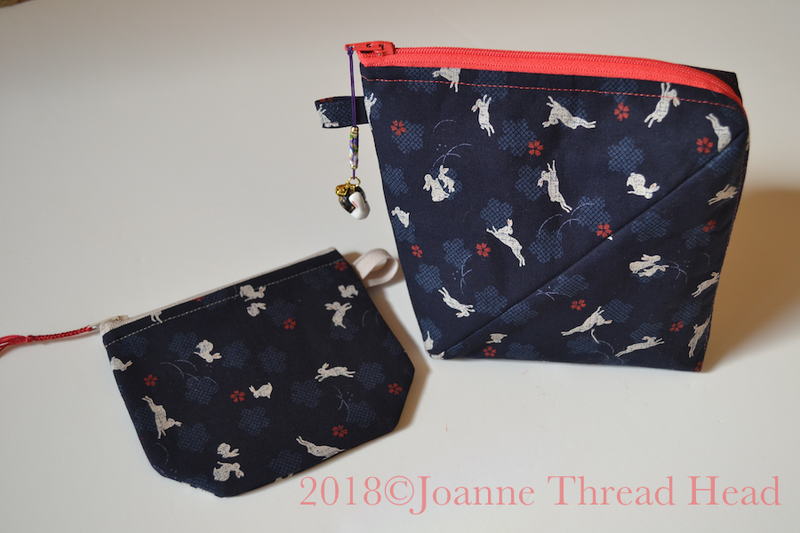 I made a Bendy Bag from Lazy Girl Designs this week. This is the second one I have made. They are a great size - perfect as a project bag for a pair of socks and wonderful for chargers, earbuds and cables for electronics when I travel - so of course I needed two. I have the pattern as part of a Craftsy Class that is no longer available. With the bit of the fabric that is cut out of the bag I made Bendy Bits bag. 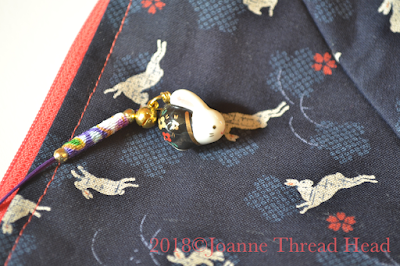 I bought the fabric when I went to Japan last year, and I happened to have bought a little rabbit charm that matched perfectly - I love rabbits and came home with a few rabbit items, the avatar for my blog is a rabbit too. I just love reading of your fiber adventures, Joanne. Glad you’re still quilting, though! I have recently knitted a pair of socks with my own opposing ply handspun (also 2 Z, 1 S plied S) but mine is superwash BFL dyed by someone else from deep in my stash. I spun the yarns quite a while ago and had planned to "finish" them but got impatient and decided to just knit them anyway. I more often than not knit before washing so this is nothing new for me. Did you find that the Z plies want to escape as you knit? Mine did. And I also found that no matter how uneven the yarn looked, the knitted sock fabric was amazingly even. I was using 2.25 mm circular stainless steel needles toe up. The twisted rib pattern I was knitting on the front of the foot disappeared and was very tight. I'm planning to snip and rip that part and then work each row up again, then Kitchener stitch the final row at the ankle. Or I might just send them along to my bestie as part of her birthday present. (She is tiny so they will fit her foot.) I've started a second pair in the meantime with the second yarn I spun when I did the first yarn. I'll add a few more stitches and see how it goes. Mine are blue, also toe up, 44 stitches which might account for them being so narrow. I enjoyed seeing your toe ups. Thanks for the encouragement.